Performance boost in a box. Is your PC starting to cough up hairballs when playing games? 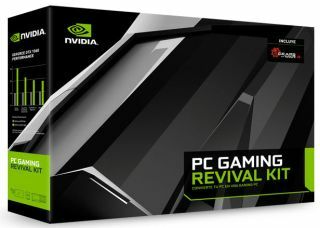 Nvidia will soon offer a "PC Gaming Revival Kit" that will breathe new life into older systems for €399. VideoCardz found the bundle being advertised in Spanish-speaking countries. According to the site, Nvidia's kit consists of a handful of branded goodies, including an MSI GeForce GTX 1060 3GB OC Twin Frozr graphics card, Corsair Force Series LE 240 SSD, Corsair CX450M power supply with 80 Plus Bronze certification, a download code for Gears of War 4, and an Nvidia T-shirt. If purchasing those items separately, the parts would add up to around the same price as the bundle, so it will be interesting to see how Nvidia pitches the kit when and if it makes the bundle more widely available. If nothing else, it would make a neat and tidy gift for someone in need of multiple hardware upgrades.